In their market overview Market Overview, ePurchasing And Contract Life-Cycle Management In 2011 to 2012, Forrester describes four forces that are keeping supplier networks dynamic and competitive. They talk a great deal of sense but they forgot the fifth force – the one that’s going to make 2012 the year for supplier networks. Forrester pinpoints four forces: cloud, vertical focus, “smart computing” and increased value of networks driven by the exchange of work objects like POs and invoices. I strongly agree with Forrester’s analysis. Cloud is rapidly becoming the standard for IT deployment. It’s becoming all pervasive and although it’s not without it’s risks, the rate of change of practice is out pacing the rate of change of policy. Cloud is a natural fit for supplier networks and as it matures and as it become more embedded, the networks are bound to be strengthened. Vertical focus too is a strong and obvious force. Like the vertical focus that supported ERP growth in the 1990s, we’re at that stage in the life-cycle of supplier networks where they need to focus much more closely on industry specific features in order to move to the next stage. Smart Computing is an interesting one. 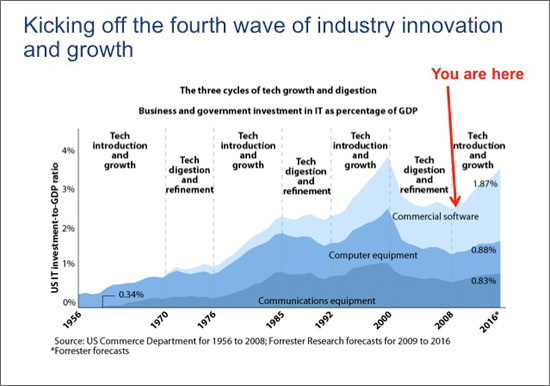 It’s a Forrester term used to describe to evolution in computing we’re seeing now that Forrester believe is the next big thing – the fourth wave. Mainframes in the 1950s, PCs in the ’80s and 90’s overlapped and followed by networking and now, “smart computing” which “extends the reach of computing systems into the realm of physical assets”. Like 3D cinema it’s at least the third time this has been predicted as the next big thing. From the internet fridge, to the “internet of things”, we’ve heard it before, but this time we can believe in it. Why? Because it’s already happening. RFID for example – an established and trusted technology used in logistics, retail and hospitals where it’s being used to track valuable medical equipment. Forrester’s fourth force, the exchange of critical work objects, is fundamentally what supplier networks are about. The value of a network proportional to the number of active members. Indeed, if we suppose that Metcalfe’s law applies, it’s value if equal to the square of the number of networks participants! That makes every new member of the network inordinately valuable. But there is a fifth force and it’s the biggest of all – legislation. Those focused on their home markets may be surprised at the enormous growth and maturity of e-invoicing in some geographies. 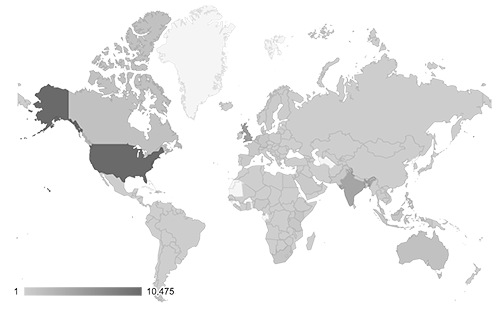 Latin America in particular, Argentina, Chile, Brazil and Mexico are amongst the most aggressive adopters of electronic invoicing and it’s largely driven by legislation. Whether it is about mandating the use of e-invoices to government or, as in Europe, its the relaxation of regulations that prevent it’s use, legislation is laying a huge part in the increased use of supplier networks. We may have seen the beginnings of the land grab already with he acquisition Quadrem and more recently of b-process by Ariba and we are likely to frenetic activity as the networks and investors stake their claim.